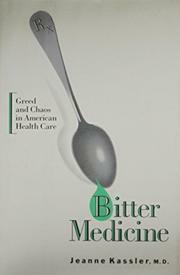  Its subtitle notwithstanding, this is not a polemic but a cool and balanced analysis of our ailing health care system. An internist and journalist, Kassler (Gay Men's Health, 1983) approaches the system as though it were a patient--taking its history, noting its chief complaints, examining it, and then coming up with a diagnosis and plan of treatment. The history shows that the system underwent enormous change when third-party payers severed the connection between receiving care and paying for it. After identifying the system's chief complaints as spiraling costs, access problems, insurance hassles, the vanishing family doctor, and loss of privacy, Kassler examines the system's many players. First to come under her critical eye are the multitude of new industries spawned by the availability of huge funds from Medicare and Medicaid. Then she deftly probes the pharmaceutical industry; the medical profession; the media, especially for its part in boosting public demand for high-tech medical services; society's changing values; the government's multiple and complex roles; and the effects of the legal system. Her assessment is that the health care system is becoming too expensive and exclusionary and that we must create something stable, fair, and flexible. To do so, she says, requires setting some general goals: stabilize costs, provide universal care, ensure medical advances, take the anxiety out of the system. She proposes some broadly defined steps toward reaching these goals: pool our risks, maximize choice, move to community-based primary care, demedicalize social problems, separate insurance from employment. Her approach is holistic--working on all parts of the system to ``nudge all players toward reform.'' In a brief epilogue, she takes issue with many of the Clinton plan's specifics. Highly recommended--convincing and comprehensive.